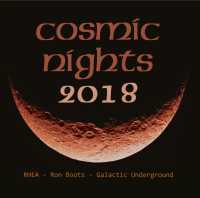 RHEA - Ron Boots - Galactic Underground (Johan Geens) play on the 19th of May during the unique Cosmic Nights series. The planetarium of Brussels will be transformed in a tranquil place of Cosmic music. This CD will accompany their perfomrnace and is a gift for all who came to this unique evening!